Felony is an open-source pgp keychain built on the modern web with Electron, React, and Redux. 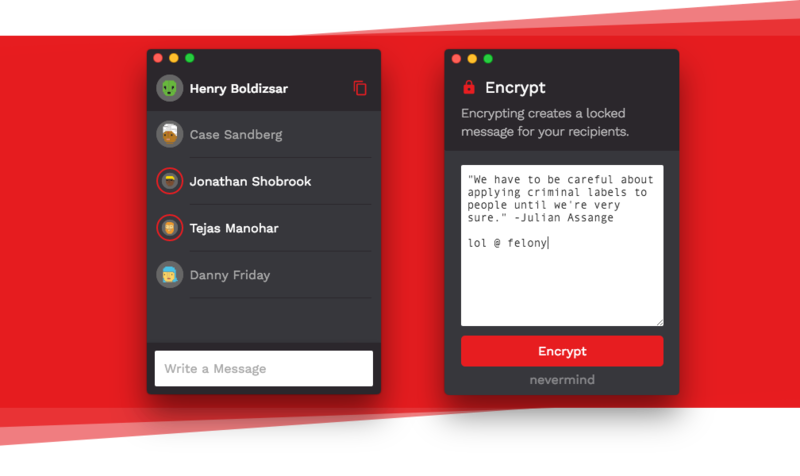 Felony is the first PGP app that's easy for anyone to use, without a tutorial. Security++ to the greatest extreme! You can download compiled versions of Felony for Windows, macOS, and Linux from https://github.com/henryboldi/felony/releases. The app is currently in its pre-release stage, so it hasn't been fully tested on all platforms. Confirmed to be working on Mac, as that's what the developers own. A public key is like a username - Adding someone’s public key to your buddies list lets you send them messages. You can find other public keys on markets like Keybase.io and Darknet. Select a recipient from your buddies list and compose a message. Only your chosen recipient(s) can read the message. Encrypted messages can be used to send sensitive information, such as an address, document, or anything intended to be read only by intended recipients. You can send the encrypted message on any website! Send encrypted messages over Facebook Messenger, Twitter DMs, YouTube, Instagram, or anywhere else. Felony is security when and where you want it. For more information check out electron-react-boilerplate, which we used as a starting point. Have an idea for a feature you'd love to see in Felony? Create an issue and tag it as a feature request. Maintained with ❤️ by Sanil, Frank, Krish, Daniel, Sameer, Ivy, and Willow. Created by Henry & Case. Would you tell us more about henryboldi/felony?